Overwatch's newest hero, Hammond the hamster aka Wrecking Ball, goes live next week – AiPT! It’s finally happening. Get your salt treats ready. The wait is finally over my friends. 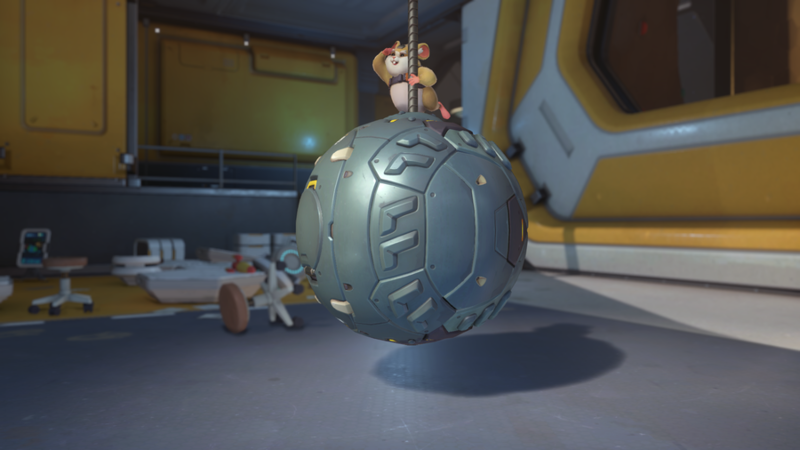 Hammond the hamster aka Wrecking Ball, Overwatch’s newest hero, goes live on Overwatch servers next week on Tuesday July 24. Blizzard made the announcement via the official Overwatch Twitter account, writing “Beware of small mammals.  Wrecking Ball rolls into the fight 07.24.18.” Along with the release date Blizzard included a cute gif showing a sweating Hammond running atop his mech, which happens to be one of his highlight intros. It’s important to note that Hammond’s highlight intro seen in this tweet isn’t the highlight intro players will be seeing in-game. This highlight intro is unique in that it shows Hammond on a beach with sailboats in the background. Fans have discovered that the flags on the sailboats are sporting the Summer Games logo, which has led to speculation that the Summer Games event will coincide with Hammond’s release. Hammond is Overwatch’s 28th hero and fooled more or less everyone with his reveal as a hamster tank. Based off of the teasers and clues Blizzard leaked leading up to Hammond’s official announcement, fans had long speculated that he was a monkey from the same lab as Winston. Imagine everyone’s surprise to find out that he’s actually a hamster and exceptionally mobile tank that rolls around in a self-constructed mech.